The SAJS Hall of Fame was founded by Eddie Trester as a way of recognizing members or past members of the Jazz Society who have greatly impacted or benefited the organization. The inductees are in no way based on talent. They are based on their likeability in the Jazz Society and how have left or are leaving a lasting impact on the Jazz Society. There are no "applicants" into the Jazz Society, only selection by the SAJS Board with Presidential approval. Inductees are recognized at the jam at the end of the month in which they have been inducted (inductees in December are recognized in January). This page is to primarily recognize the inducted members and give brief bios of them. 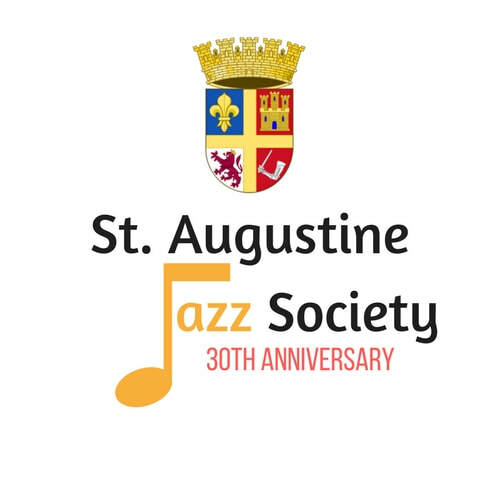 Marge Ordway was a member of the St. Augustine Jazz Society for years. She brought many laughs and smiles to the Jazz Society. ​Marge started in St Mary's Academy (Milwaukee, WI) in glee Club, Musicals and plays. "After College and 10 years between performances, I started to sing with the "Kenny Davis Trio" at Rip's in Waterford, Michigan. We entertained 4 nights weekly for 5 years. After the owner sold the Restaurant/Bar, we worked at Holiday Inn, Brandys, in Bloomfield, Mich. I also sang with a 21 piece band out of Detroit for 6 months. (That band leader died and the band broke up). I gave up the night life for a while due to a flourishing horse breeding & showing business and a pharmacy career. When I retired, a close friend, Robbie Moore, talked me into singing at Crackerhouse Dunes with Gil and the Boston Connection. So that's how I joined in with the local talent like Eddie Trestor, Kenyon Dye, and the Jazz groups in St Augustine." Marge passed away on January 17th, 2017. "The St. Augustine Jazz Society lost one of its great vocalists, Marge Ordway. Marge was always comfortable with a mic in her hand and had a voice that could match that of jazz singers like Rosemary Clooney, Patti Page, and Peggy Lee to name a few. She had a great love for people, a beautiful smile, and lived life to its fullest. Marge will be truly missed by all of us." Marge has been inducted because of her lasting impact on the Jazz Society. Her love spread like wildfire as soon as you met her, her smile lightening our days. Her love for young musicians still remains strong today. Marge was loved by all and respected by all and is an amazing role model, living her life to its fullest potential. She will be greatly missed. We are honored to have known her and are happy to have her as a member of our Hall of Fame. ​We lost a true friend of the Jazz Society on Saturday, November 18, 2017: Gilbert Surette. He was the Boston Connection band leader. Gil was an ardent and long time supporter of the Jazz Society. I want to share with you a little bit about Gil. Most of us just saw him up on stage blowing his heart out on his beloved sax or clarinet. But, he was a husband and father. He had two daughters, Debbie and Diane. Diane was killed at a young age in an accident. Debbie lives up in Massachusetts. Gil was born in Lynn, Massachusetts in 1925 and would have been 92 years old in December. Having studied music in Boston, he decided to call his band the Boston Connection. His music education took him many places in this world. During WW II while serving in Germany, Gil was called upon to play in a show band which entertained troops and toured throughout Southern Germany. The leader of that band was none other than Dave Brubeck, one of the all time jazz greats. Also accompanying the band was the Radio City Rockettes. I'm sure this was one of the high points of his life as he told me this story numerous times. The last time being two days before he died. After the war, he went to college and received a degree in civil engineering. Since he loved to fly, he was lucky enough to secure a position with the Federal Aviation Administration and worked there for many years. During that time he was involved with the development and safety of public airports and became a commercial/instrument pilot. Gil had a wonderful life here in Florida when he retired. He was an old time jazz man, playing Dixieland with Ed Hersom was one of his favorite things to do. He seldom forgot to include Ed Mye's "one more time" in the band's rendition of "New York, New York." But, the song I will always cherish is him playing "Back Home Again in Indiana" on the clarinet. My father's favorite song.